Join UsBecome a Newton Nitro swimmer! Swimming is a sport for all and it represents every age group, ethnicity and background. It’s a sport for life that can guide you to learn to swim, prepare for college or make the next U.S. Olympic Team. There are countless benefits of swimming including getting fit, getting fast, meeting friends and having fun. We also feel it makes you smarter, as swim team kids perform better in school! Level of swimming experience and any known interest/knowlege about the Nitros. Do you wish to register more swimmers? If yes, we will email for further details. May qualify for reduced USA Swimming registration fee. Requires verification from school. IMPORTANT: THE PARENT/GUARDIAN IS RESPONSIBLE FOR NOTIFYING THE HEAD COACH OF ANY HEALTH CONCERN, INCLUDING THE SWIMMER’S USE OF MEDICATIONS, WHILE THE SWIMMER IS ACTIVELY PARTICIPATING ON THE SWIM TEAM. Swim Newton Inc may make available a Team Roster and Directory - primarily for team members to connect - but we respect your privacy. Your family listing will look as it does below; if you would like to have specific information NOT included, please request below. The team, from time to time, may be featured in news media, on the official team website or on social media (e.g.Facebook) using photos, videos and descriptions. To opt-out, include that in the field below. I do hereby covenant and agree that I assume all risks associated with my participation and/or listed participants in the Swim Newton Team’s authorized activity(s) and do hereby accept that any injury or injuries I may suffer from my participation and/or listed participant’s participation in the Swim Newton Team’s authorized activity shall be my own responsibility and associated with my participation and/or listed participant’s participation in a Swim Newton Team authorized activity. Furthermore, I covenant and agree that this document shall be admissible in any court of competent jurisdiction, which adjudicates any cause of controversy existing between the Swim Newton Team and myself. Newton Nitros Swim Club (Swim Newton Inc) is a nonprofit 501(c)3 organization founded in 1996 with the goal of helping team members develop and refine their swimming skills. Swimmers practice year-round at the Newton High School pool and at the Newton Municipal Pool during summer months. Newton Nitros Swim club participates in the Missouri Valley Division of United States Swimming. Nitros swimmers have the opportunity to develop and excel while participating in USS sanctioned swim meets. As swimmers progress and achieve qualifying times, they may participate in Missouri Valley and USS Championships. Nitros have competed in District MV Championships, Missouri Valley Championships, Central Zones, Sectionals, and Junior National competitions. There have also been several swimmers go on to participate as scholarship athletes at the NCAA Division I and II University level. Provide a program with professional coaches who teach and train all levels of athletes; emphasizing individual progress, team unity and family participation, while encouraging athletes to develop the character and self-discipline necessary to succeed not only in swimming but also in life away from the pool. 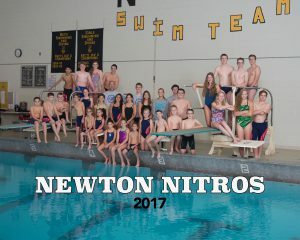 © 2019 Newton Nitros Swim Club.